Today I am bringing you a life lesson. And that is this: If you food blog, don’t plan to eat the food that you are photographing as soon as the shoot is done. Especially on an empty stomach. You know what that leads to? Rushing. Rushing = forgetting things that you SPECIFICALLY went to the grocery store RIGHT before the shoot just to have for the pictures. Perfect little bright green lime, I am looking at you. Yep. I went out and spent 10000 years picking the most perfect lime eva, since this is cilantro LIME tilapia, and then my hunger got the best of me and I FORGOT THE LIME. So now I’m sitting here looking at these pictures and being annoyed because that little colorful fruit would have made the perfect touch. Not that I’m bitter or anything. Can you just do me a favour and use your lovely imaginations and pretend that it’s there, and this doesn’t look like boring “cilantro-only” tilapia? Thanks peeps. So, this easy peasy limey-squeezy (too much?) dinner is one that I actually eat on a very regular basis. And by regular I mean 2-3 times/ week, along with my favorite vegan coconut curry and mango chicken with coconut cauliflower rice. and It’s THAT good and THAT easy. It’s my go-to-I-just-got-home-from-work-and-I-dunno-what-to-eat-so-cilantro-lime-tilapia-it-is dinner. 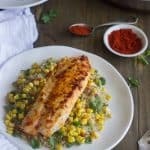 Although, sometimes I switch the toppings up and make this Peanut Lime Tilapia instead. I live life on the edge guys. Now that we’ve got that out of the way…let’s talk about fish. Do you like it? Do you think it’s the chicken of the sea? Are you anti Ocean Swimmies? Personally, I adore the little blubsters. Sidenote: “blubsters” because fish say “blub blub.” I once had a fish named “Blubby.” I’m super creative like that. And, if you don’t like lime, well….apparently my subconscious doesn’t either. So, you’re golden. I’ll get over it one day. A weeknight dinner for the whole family! 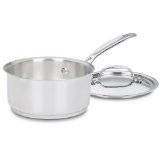 In alarge pot, bring the water to a boil over high heat. Once boiling, stir in the quinoa, cover and reduce the heat to low. Cook until all the water is absorbed, about 15 minutes. While the quinoa cooks, spray alarge panwith cooking spray and heat over medium/high. 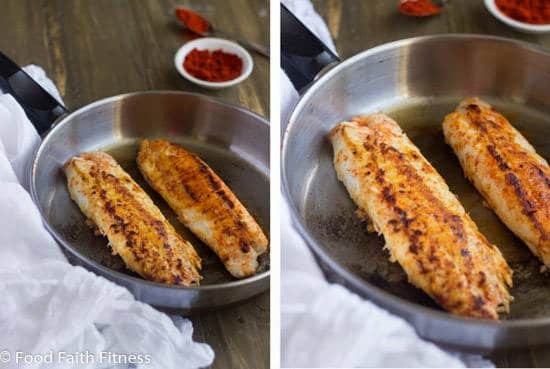 Sprinkle each side of the tilapia fillets with smoked paprika and cook until white and flaky, about 2-3 minutes per side. Cover and set aside until the quinoa is ready. 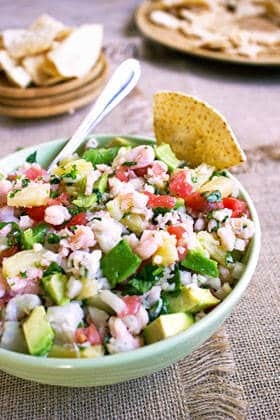 Toss the cooked quinoa with the corn, lime juice, garlic powder, onion powder and cilantro. Season to taste with salt and pepper. 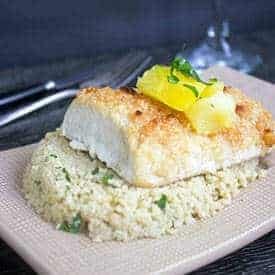 Divide the quinoa between two plates and top with tilapia fillets. Drizzle on sriracha is desired. Want more seafood? Try these out! YOU HATE FISH?! Friendship over. I love everything in this dish. Great recipe! This sounds delicious! Hah know exactly what you mean about leaving something out of the photos and then kicking yourself for it! Don’t worry my imagination photoshopped the lime into the shot. : ) I haven’t had tilapia in forever so hopefully will be able to find some in Malaysia (where I’m renting an apt for the month) so I can give this a whirl! You and your imagination are my favorite and I thank you x 1 million! SO COOL that you’re in Malaysia! Do you love it? I bet you are eating some amazing food, even if you can’t find tilapia! Malaysia is really nice and the food here is delicious – though I’ve been cooking up a storm so not sampling the local delicacies as often as I would like (my boyfriend and I have been traveling around Asia and Europe for the last 1.5 years so are just trying to slow down here in Malaysia and catch up on cooking — which I miss so much when we are traveling fast and having to eat out for every meal)! Happy to come across your blog though and look forward to your future recipes! Thanks for your sweet words, I hope that you are having the best Wednesday eva! Ohhh does your lesson hit home with me 😉 SO frustrating when you forget something. I think we just have to write stuff down! This recipe looks great though…cilantro and lime sounds perfect. and all over quinoa…Pinned. Thanks for sharing my dear! Ohhh writing down things I want to include is a great idea, you brilliant, beautiful lady! Thanks for all your sweet comments and pins Kelly! Oh man isn’t that the worst?! I do that ALL the time. Totally rushing through shoots (usually the baby haha) and forget something specifically I wanted in it! This still looks perfect though! Love cilantro and lime together – pinned! Haha, I wish I had a baby as an excuse….I’m just hungry haha! Thanks for the pin lovely lady! You got me! I am one of those anti ocean swimmies camp people, but have been trying to change that. It was my resolutions this year to learn to like fish and I figured out that Tilapia is actually pretty good. It’s the only fish I’ve cooked so far and I cannot wait to try your recipe. Lime or not, this recipe looks and sounds absolutely mouthwatering!! Oh my goodness, I HATE when I forget to put something in the picture! The worst. Actually, the worst might be when I lose the recipe I wrote down on a scrap piece of paper. I need to get more organized about where I write down my exact measurements. This fish sounds delicious. I’m a major fish lover. I just made some last night! Love the mexican flavors in this dish. I almost want to the leftovers and flake it and put it in a taco. Yum! Losing the recipe is the worst! I have a notebook that I write them in. Except I write so fast or spill an ingredient on it…annnddd then I can’t even read it hahaha! OHH a taco! Totally doing that! Tilapia is one of my all time favs! I am so glad you posted this instead of spending another 10000 years going back to the store for that lime, even without the lime – your pictures look GORGEOUS – Drool worthy – Screen lickable – totally yumsiferous – you get the picture! No pun intended! Thank you Shashi! You’re always the sweetest! Haha well I guess I shoudn’t have pointed it out then 😉 Thanks Stephanie! I love fresh and easy weeknight meals like this! It looks SO scrumptious, Taylor! Aren’t they the best?! Thanks Georgia! I feel for you. I forget to get things at the grocery all the time. But you managed to take some awesome pictures anyways 🙂 I love seafood, but need to start cooking tilapia more. 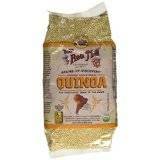 The quinoa looks amazing as does the fish! Cilantro and tilapia…what a great combination, Yummy! I see that gorgeous little lime sitting there. :). 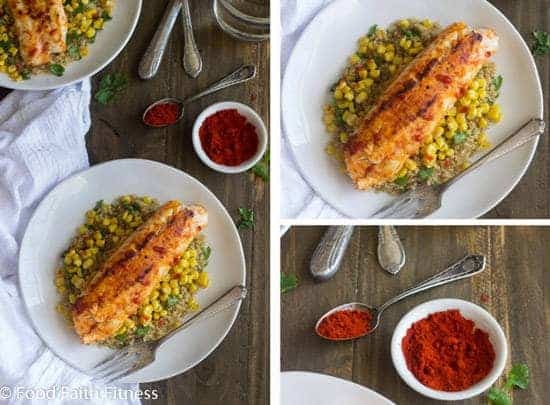 I haven’t tried tilapia yet but you are persuading me in that direction with this lovely recipe and your photos. Haha thank you Norma! 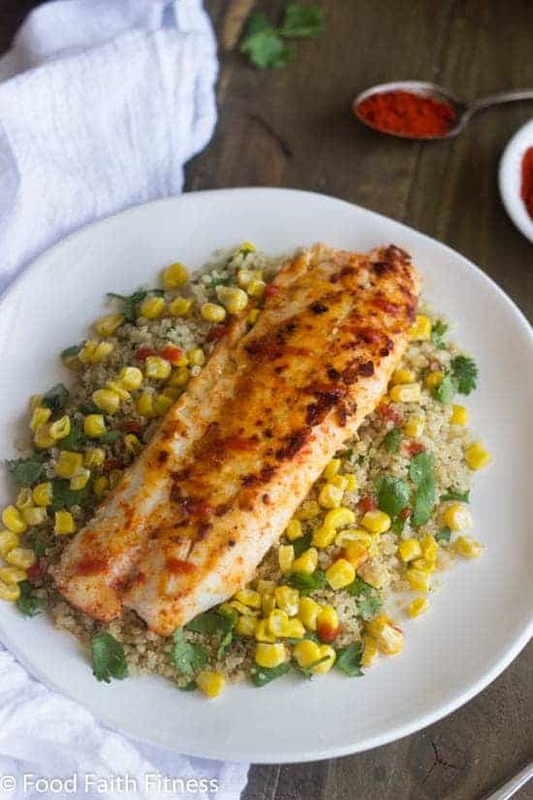 You need to try tilapia…it’s so mild and moist and flaky! The perfect fish! It is a very tasty looking plate of food even though I am not a fish person myself. However, everyone in our family loves it except for our daughter in law and myself. Chicken would be very good though. I’ve done that before Faith LOL. So funny, I just made fish with corn for the boys tonight using flounder fillets I found at Costco’s. I topped the fish with a crunchy garlicky parsley bread crumb mixture and Meyer lemon juice. My boys are not big fish eaters, but they all commented on how good it was – which was a huge surprise – made me doing a little dance. 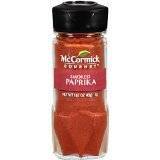 Next time, I’ll add some smoked paprika like you did – sounds delicious! I love the costco fillets! That’s where I get my tilapia! Your fish sounds delicious…I’ll have to try that! I love so many things about this dish (lime or no lime)! 🙂 I love tilapia and the quinoa with cilantro and lime would be amazing! I’m pinning this and adding it on my list of things to make right…now! Thanks so much for the sweet words and the pin Kara! Haha story of my life…always hungry. Not good for a food blogger who has to take pictures before eating! Haha we need to stop planning it like that eh?! The worst! Strange!! I left a comment and now it isn’t there. I am not a fish person and neither is our daughter in law. The rest of the crew love it though. I could see chicken on this. Weird, I approved one from you yesterday! Chicken or fish would be delicious! The funny thing was after I left the second one the other one popped up. Crazy!!! I always buy those huge individually portioned frozen bags of them at Costco…as they make super easy meals! If I could only tell you how many times I’ve forgotten a lime in photos…endless! I’ll just pretend it’s there. 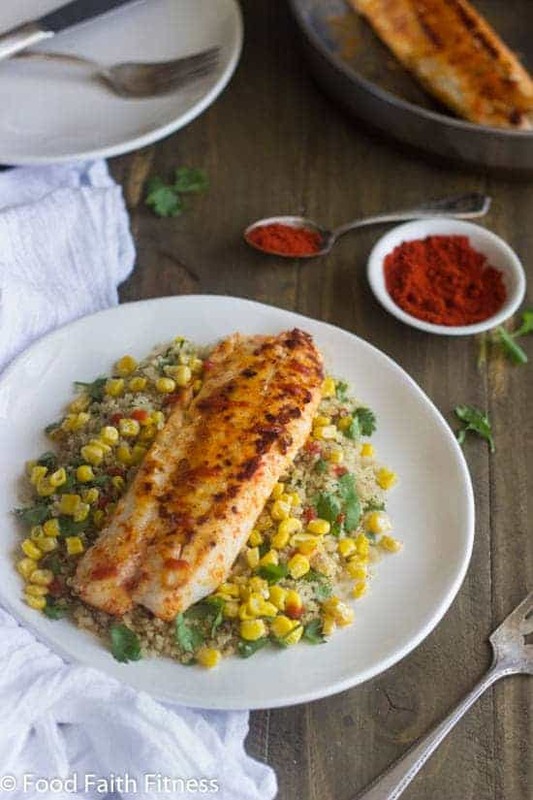 Tilapia is such a great clean slate for big bright zesty flavors like this! Thank you for the pretendage Joanne. I love you! Haha thanks girlfriend! 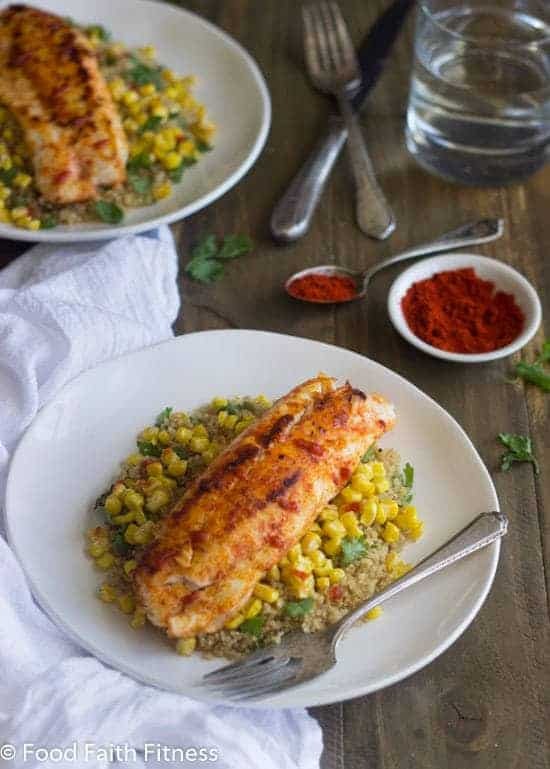 Ohhh Cilantro lime salmon sounds deeeelish! Yes…yes you can use that lime…let me know how it turns out! This fish looks fantastic! I love everything cilantro lime!! Cant wait to try 😀 Pinned! Thanks Layla! I hope ya love it as much as I do! Hate when that happens!! But it turned out beautiful nonetheless! 🙂 Perfect weeknight dinner! Love Tilapia, Love Cilantro, can not wait to make this my family will love it. Thanks Lara, I hope that they do! I ALWAYS forget little proppy thingies for my food photos when I’m hungry. It’s definitely infuriating. But if it makes you feel better, I wouldn’t have looked at your gorgeous pictures and thought: “wow, that really needs a lime” – they’re beautiful, my dear, and your recipe looks amazing! I’m all about easy peasy seafood meals. Slap blubber on my plate, and I’m happy! Thanks girl, I definitely feel better! You and me both…love the blubsies! You know, I was totally going to make this until I noticed there was no lime in the photo… and then I said, nope, no way. Not doing it, hahaha. Just kidding 🙂 I do that ALL the time. Isn’t it super frustrating?! This looks great, and done in under 30 minutes is a big win! Haha…yes! It is just the worst! Thanks for the heads up! hahah, Man I wish someone told me that yesterday! Taylor….. No joke, we are seriously twins separated at birth. I’m 5’2″ (ish… sometimes at the doctor’s office they round up to 5’3″), and my guy is nocturnal too. Well, yours might not be by choice. But my guy stays up super late, and I’m a morning person. Kinda rough (and a little lonely/awkward) some days. But hey, that’s what compromise and relationships are about, right? But back to the exciting thing: your fish!! I am a HUGE fan of tilapia! Do you have any tips for minimizing the fishy smell after cooking seafood indoors? It drives me crazy, so I really only cook it during the warmer months when I can do it outside. I’m strange, I know! Haha I am that too…and they round me up too! This is getting scary! So true, this is really freaky… And to think, this all started because I saw your gorgeous cheesecakes on Foodgawker! 🙂 That’s awesome that you don’t notice a fishy smell! Maybe it’s just the way I prep or cook it… My mom never allowed fish to be cooked in the house because she hated the smell, so it could be that I’m overly sensitive too. Who knows! The lime thing has happened to me lots of times too and it’s so annoying indeed ahh :–( Your pictures do look lovely though. And so does the dish – it sounds super yummy! Ha! You are too funny about the lime…the photos look GORGEOUS even without the lime 🙂 but as a food blogger this happens to me all the time! Isn’t it the worst?! Thanks a million lovely lady…happy Monday to you! My husband made this for dinner tonight (I hunt blogs for things to try, he does the cooking) and it was fantastic! We didn’t have smoked paprika so he used Penzy’s Singapore Seasoning and a little garlic powder. It looks delicious, Taylor. Even without your lime! I’ve done that too…it’s frustrating, isn’t it?! I pinned it, because I am going to make this. We need to start eating more fish! This absolutely delicious Taylor! Totally pinning this and need to make this asap! Thank you lady! you would LOVE it! Hi Hannah. As far as the Peanut Lime Recipe goes, I actually took it down. it was one of my VERY first recipes, back when i didn’t really know much about recipe development and it’s not the best recipe ever! Sorry! Glad you like this one though! This recipe is excellent! I have made it twice and my family and I loved it. However, I had to use sole fish and Dory instead of tilapia because it was the only thing I had in the fridge that time. Thank you so much for sharing this recipe! I’ve made it with sole before! I’ve never tried Dory though! I am so glad you and your family love it! 🙂 Thanks for letting me know! Hey, Hun. I know I’m 2 years late, but would you happen to know how many calories this meal is? Thanks so much in advance! This recipe was created long before I started adding nutritional information to recipes, but feel free to plug it into something like myfitnesspal.com and it will tell you! Thanks! Great recipe, perfect for mixing up a picnic a little, it is nice to have something different to eat !! So I honed in on this recipe because I knew I had all the ingredients. Got the quinoa cooking then started pulling out everything else. But the limes…where were the limes? Searched the front fridge, the back fridge, and then gave up and used lemon juice. As I was putting stuff back, all of a sudden I caught a glimpse of green in an unusual place. Sure enough, the limes I knew I had decided to make a late entrance to my party. I went ahead and cut one in half and squeezed it on top of the dish, so I guess my tilapia is with cilantro and Sprite! Delicious and easy…something I will make again…the right way next time! Haha @ cilantro and sprite! But I am so glad you liked it either way!